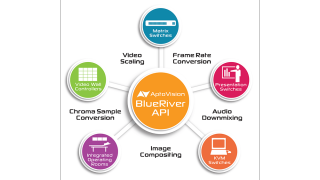 AptoVision has released BlueRiver API, a complete application programming interface that lets developers harness all the features of AptoVision’s BlueRiver NT+ Series of AV-over-IP chipsets, which transport uncompressed, zero-latency Ultra HD/4K HDR over ethernet. BlueRiver API and the full BlueRiver NT+ Series of AV signal distribution chipsets will be presented at ISE 2017 (Amsterdam, February 7–10) on stand 12-H55. The building blocks in BlueRiver API include interfaces to control upscaling to 4K, downscaling, aspect ratio management, frame rate conversion, chroma sample conversion, video wall processing, image compositing, audio downmixing, video routing, independent audio routing, multicast IGMP management, and much more.